NOTICE THE ADY GIL IS UNDER FULL POWER TAKING HER DIRECTLY INTO THE PATH OF THE JAPANESE BOAT...BETHUNE ADMITTED SINKING HIS OWN BOAT UNDER ORDERS FROM WATSON. HOW DO ACTIONS LIKE THESE IN ANY WAY HELP TO 'SAVE THE WHALES'? 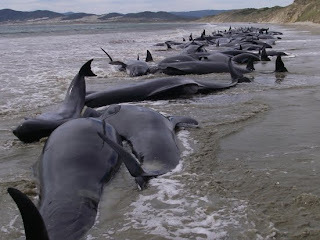 The reality is that these people and organizations are VASTLY CAPITALIZING on the uninformed public's love of cetaceans, not to mention the whales and dolphins themselves, while functioning primarily as 'media content providers' for television (Animal Planet's 'Whale Wars') and cinema (The Cove), AND at the same time TOTALLY OMITTING any mention whatsoever of REAL GLOBAL THREATS TO ALL MARINE LIFE coming from LFA-sonar, seismic/geo-physical exploration (some of whose technologies are identical to LFA-sonar); radio-logical contamination of the global ocean from the on-going Fukushima disaster (which as of July had released on the order of 1.5 exa-becquerels of ionizing radiation into the biosphere); and finally, the GREATEST SINGLE THREAT to marine life, the U.S. Navy, whose warfare, experiments, wastes, operations, and technologies (including HAARP) outweigh the damage from all other sources combined. 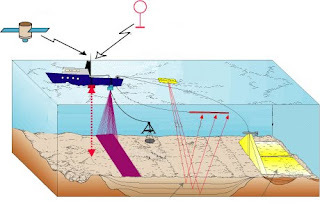 The U.S. Navy, who was granted a 'permit' to 'take' 11.5 million marine mammals over a five year period, like the rest of the military-industrial complex, is quite literally a state-sponsored 'geo-terrorist' organizaton funded by YOU. How can ANYONE even pretending to 'save the whales' remain in TOTAL SILENCE concerning these grave issues affecting human health as well? "Omission is the greatest form of lying"
'CYBER-SECURITY'/WAR ON THE INTERNET: Hack Yourself Awake! IN CONCLUSION: "Act Now to Create a World You Love"
ROSE AND EVERYONE...Jeff here again. All this stuff with the whales and dolphins is REALLY SICK. 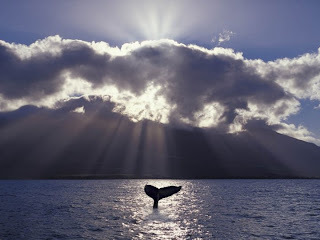 The cetaceans are the highest beings on this planet and "man, the wise" regards them as "beautiful animals" which, when it comes down to it, are pleasant to watch but ultimately are expendable when 'resources to fill human needs' come into play. We view each other this way, why not the whales? BUT humans fail to grasp that when we endanger the cetaceans, we are wreaking MASSIVE KARMIC DAMAGE on ourselves...to me, even more than when we endanger each other. I'm going to be posting a lot more in-depth information on all this soon, as well as a new 'beyond film' we are working on, on who the cetaceans are as fellow beings...but for now, it's EXTREMELY IMPORTANT for us to realize that the 'save the whales' enterprises sound good on paper or on tv...BUT when it comes down to the reality of the situation, these people and organizations are functioning more as a DISTRACTION from the real issues rather than actually helping in a significant way. To wit: Capt. 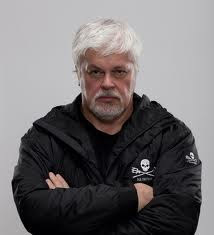 Paul Watson/Sea Shepherd and Louis Psihoyos/Ocean Preservation Society, producer of The Cove: both target and demonize "clearly evil Japanese" who are conducting "scientific = culinary whaling" or "dolphin slaughter"...which IS of course barbaric. BUT the reality is that, as 'evil' as these practices are, even if unimpeded by 'save the whale' organizations, only a few thousand cetaceans are harmed. This is of course not acceptable BUT the reality is that these same people/organizations TOTALLY FAIL TO EVER MENTION EVER the astronomically greater threats to ALL CETACEANS from military-industrial activities like off-shore seismic exploration and the U.S. Navy's LFA-sonar...both of which are forms of acoustic warfare, especially given the increased energy of sound transfer in marine environments; nor do any of them EVER MENTION the threats from network of 'technetronic' weapons systems using R(adio) F(requency E(lectro) M(agnetic)R(adiation) transmitted from numerous sites on land, sea and space; NOR do these "save the whale" people mention the unprecedented radio-logical contamination of the global marine environment, specifically from the ASTRONOMICAL QUANTITIES OF RADIO-NUCLIDES FROM FUKUSHIMA that are poisoning the oceans around the world. 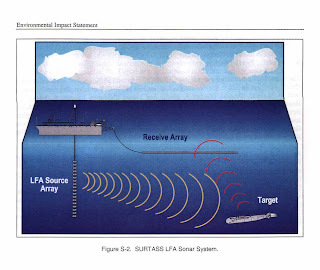 The U.S. Navy and American-based corporations and banks in general who run the military apparatus...like Anadarko...and who are behind the 'technetronic warfare' scenario...HAARP and chem-trails...constitute threats to cetaceans the world over, threats that are literally MILLIONS OF TIMES greater than anything that Japanese whalers and fishermen are doing. "The terrible number of those killed, maimed or diseased, an irreversibly damaged ecology, the obscene cost of nuclearism and interventionary war, all require harsh conclusions. Whatever their motivation, the bosses, warriors and arms hucksters are killing us, while simultaneously, they kill the environment. The attack on humans and the natural world is indistinguishable. They coincide in an attack on life itself. For the Earth is our matrix, our womb, our mother." Yet Watson and Psihoyos NEVER MENTION any of this. Why? Because, wittingly or unwittingly, they are part of it themselves. They may not be 'conspirators' but they may have internalized unquestioned beliefs which allow them to support the 'wars' on 'global warming' and 'terror', and "all things American" as gospel, like nuclear power. They both say as much. 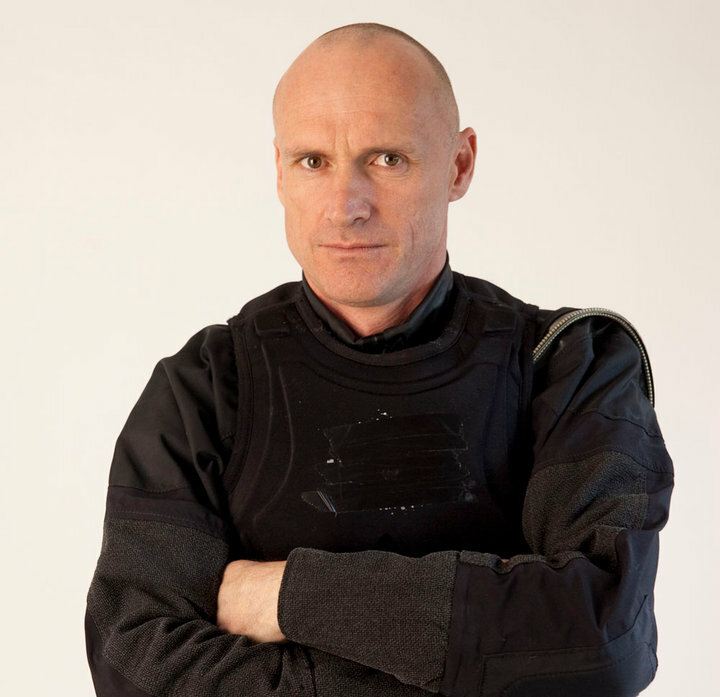 Plus, Watson is an officer in the Coast Guard, just like Admiral Thad Allen who was in Christchurch for the Feb. quake, and SS claims to be operating under the UN World Charter for Nature "which allows private organisations to interfere in government-like ways in the interest of the environment"; Watson even goes so far as to condone a "radical reduction in the human population" and actually rejoiced when the Fukushima quake-tsunami wiped out entire coastal communities and released vast clouds of radiation. Watson has publicly proclaimed his disdain for 'truth' and even ordered one of Sea Shepherd's boats to be sunk on purpose...the Ady Gil...because it would be "great publicity." Ady Gil skipper Pete Bethune testified that this was in fact the case in New Zealand maritime court. Watson rationalizes such behaviour clearly and in his own words, which I will document at length in my up-coming Geo-Terrorism update. 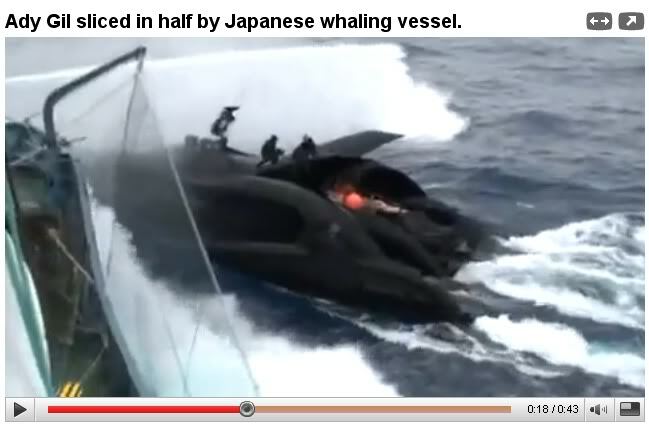 "Bethune now says he was directed by Sea Shepherd admiral Paul Watson to deliberately sink the Ady Gil after it was hit by the Japanese ship. 'It was done for PR purposes and after the sinking I wasn't allowed to talk to anyone about it and I wasn't even allowed to visit Ady Gil,' he says." Psihoyos was a photographer for National Geographic for many years, an extremely right-wing glossy NWO publication (close ties to Council on Foreign Relations) supporting the 'war on terror.' NG also runs those ludicrous "100% CLEAN AND GREEN NZ" spreads. 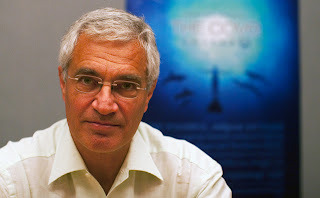 Psihoyos, whose 'cv' may as wall say "Marketing nature for the New World Order," worked with special effects people from Lucasfilms Industrial Light and Magic in order to render his original documentary version of The Cove more highly marketable. Watson and SS's overall modi operandi since Whale Wars started on Animal Planet smacks very much of CIA-influenced 'public relations' staged-reality crap (Watson himself accused Greenpeace of being taken over by the CIA), just as does The Cove with all the staged 'reality' tricks and "evil Japanese" who seem to be so cooperative on-camera. Think about it. Discovery Communications hosts Animal Planet; they also host The Military Channel. Have Watson and Psihoyos stopped the Japanese from doing these 'evil deeds'? NO. Have they both capitalized immensely from their 'save the whales/dolphins' activities? YES. And as long as they are all making money from it, these 'evil deeds' are not likely to stop. Money more than whales is the common ground of the 'evil Japanese' and the 'good guy' Yankee pseudo-environmental capitalists. "The nature of the mass media today is such that the truth is irrelevant. What is true and what is right to the general public is what is defined as true and right by the mass media. Ronald Reagan understood that the facts are not relevant. The media reported what he said as fact. Follow-up investigation was 'old news. A headline comment on Monday’s newspaper far outweighs the revelation of inaccuracy revealed in a small box inside the paper on Tuesday or Wednesday." "To walk the streets of NY at night recently, and see that majestic building lit up for our campaign filled me with joy. The first night we all celebrated outside at a rooftop bar on Fifth Avenue, wrapped in red blankets and the red glow of heat lamps, ESB beaming one the most powerful lights in the world into the sky above us." Paul Watson saying that 'truth is irrelevant' and Louis Psihoyos reflecting on a visit to the Empire State building in NYC where they wined with the building's owner who had decided to LIGHT UP THE ENTIRE BUILDING using WHO KNOWS HOW MUCH ELECTRICITY FROM FOSSIL FUELS OR NUCLEAR sources: and you STILL believe that 'saving the whales/dolphins' is REALLY these guys' highest priority? WE HAVE TO STOP SUPPORTING THESE WHALE-PROFITEERS AND WAKE UP TO THE REAL ISSUES HERE...many of which are the same major issues affecting us. The whales are closer to being "real people" than most of us can still claim to be...and they've been around for 30 million years, long enough to witness repeated episodes of "man, the wise" under-going self-inflicted re-enactment of cosmic catastrophe. Will homo sapiens finally succeed in taking itself out of the equation of life on Earth?